In an effort to provide special assistance during this recession, the Career Center is offering “Job Searching in a Recession,” a full day of workshops and seminars, April 5. Employment prospects for upcoming college graduates can be discouraging. The program is geared especially for the class of 2009, but all students are welcome to attend. The day will begin with a “Resume and Cover Letter Workshop for Beginners” at 10 a.m. in Violette Hall 1432. The workshop is for students who have not started the resume writing process. Participants will leave with a rough draft of a resume and an outline for a cover letter. Later in the day, at 2:45 p.m. in Violette Hall 1432, students who already have a rough draft of a resume and cover letter can attend the “Interactive Resume and Cover Letter Intensive Workshop.” Participants should bring drafts in electronic form. “Ace the Interview” will be at 10 a.m. and 11:45 a.m. in Violette Hall 1424. Students will learn what to say and what not to say in an interview and practice responding to typical interview questions. “Finding a Job in a Tight Market” will be at 11:45 a.m. and 2:45 p.m. in Violette Hall 1420. Presenters will explore strategies and resources to locate employment opportunities and how students should alter the approach of job searching in a recession. “The Importance of Networking in a Recession” will take place at 1:30 p.m. in Violette Hall 1424. This will be an interactive seminar that will take the mystery out of networking. “Alternatives to the Job Market, including Grad School and Volunteering” will be at 1:30 p.m. in Violette Hall 1428. This seminar will cover the good and bad reasons for avoiding the job market at this time. In addition to scheduled events, Career Center staff will be available for drop-in advising and resume critiquing from 11:30 a.m.-6 p.m. at the entrance to the 1400 rooms in Violette Hall. Students can register for events on the Professional Development Institute website at http://pdi.truman.edu/register/classlist.asp. The RiteCare-Communication Disorders Early Literacy Lab, located on the Truman campus, will be able to improve upon the free services it provides to the northeast Missouri community thanks to a $100,000 donation from RiteCare Valley of Columbia, Mo., an affiliate of the Scottish Rite, a national Masonic organization. RiteCare Valley’s mission is to aid and assist children with learning and communication disorders. In 2003, Truman and RiteCare Valley agreed to co-found and support the RiteCare-Communication Disorders Early Literacy Lab to prevent literacy problems in children who are at high risk. Truman faculty members and students provide their services at the Early Literacy Lab, while RiteCare provides funds for materials, training and other program expenses. Funds from the RiteCare Valley donation will be used to provide state-of-the-art tests, therapy materials, computers and software to aid in the evaluation and treatment of clients. It may also be used to support student research, continuing education and other related activities in the area of literacy. Members representing the Columbia Valley region of the Scottish Rite recently donated $100,000 to benefit the RiteCare-Communication Disorders Early Literacy Lab. Pictured, front row, from left; Barry Cundiff; Bobby Daniels; Duane Dimmitt; Janet Gooch, Communications Disorders chair; Amy Little; Kenneth Read, Truman Board of Governor; John Siscel, Truman Board of Governor. 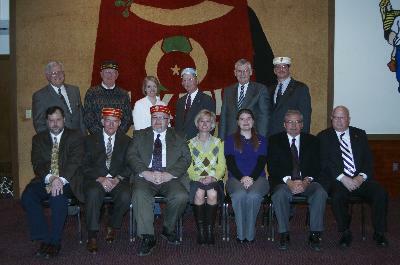 Back row; Keith Neese, Executive Director, Masonic Home; Kelley Snipes; Terri Fechtling; Robert Barrett; University President Darrell W. Krueger; Brent Stewart, Grand Lodge of Missouri. The RiteCare-Communication Disorders Early Literacy Lab is one of 178 clinics, centers and specialty programs supported by the Scottish Rite throughout the country. Located in Barnett Hall, the Early Literacy Lab is one aspect of Truman’s Speech and Hearing Clinic. Approximately 1,000 residents of all ages, from within a 100-mile radius of Kirksville, visit the Speech and Hearing Clinic each year to receive diagnostic and treatment services at no cost. In addition to providing services, the Speech and Hearing Clinic provides Truman Communication Disorders students the opportunity to learn in a hands-on environment. Students begin by observing therapy, then become clinical assistants and eventually assume the responsibilities of student clinicians. Under the guidance of certified faculty, they test and treat clients for various speech, hearing and communicative disorders such as language, articulation, early literacy, voice, fluency, augmentative and aural rehabilitation. Nearly all Truman Communication Disorders undergraduates continue their studies at the graduate level. Students with a graduate degree from Truman meet requirements for State of Missouri licensure, public school certification and national certification from the American Speech-Language-Hearing Association. For more information about the RiteCare-Communication Disorders Early Literacy Lab, or to make an appointment at the Speech and Hearing Clinic, call 660.785.7414. The 14th annual Women’s and Gender Studies Conference is set with a full schedule of presentations. The “On Men” conference will take place from 10:30 a.m.-5:50 p.m. March 26-28 in Violette Hall 1000. Papers came from a mix of Truman and Kirksville communities’ submissions. March 26 begins with Masculinity in Context 1, followed by Transgender Pioneers, Men in the Media 1, The Long View and Writing Gender. Sessions March 27 will start with Gender Pedagogy 1: A Workshop, followed by Masculinity in Context 2, Portrayals of Black Masculinity, Masculinity in Context 3 and Personal Testimony 1. Keynote speaker Patrick Dilley will present “Twitter Twinks and Lads Without Labels: Understanding Today’s Non-Heterosexual College Males” at 4:30 p.m.
March 28 kicks off with Women and Patriarchy, The Uses of Poetry, Gender Pedagogy 2: A Workshop, Men in the Media 2, Dramatic Portrayals of Men and Personal Testimony 2. Lecturer Jackie Murry will present “Poetically Erect: Erinna and Nossis in Herodas 6 and 7” at 3:30 p.m.
For more information contact Linda Seidel at lseidel@truman.edu. The department of music will host John Parks, guest percussion artist, March 24-26 for a series of performance master-classes and a solo concert in Ophelia Parrish Performance Hall. Parks is the director of percussion at Florida State University and an internationally renowned percussion artist and educator. He earned his doctor of musical arts degree in percussion performance from the Eastman School of Music and holds two master’s degrees from Northwestern University, one each in percussion performance and jazz pedagogy. Parks made his Carnegie Hall solo recital debut in Weill Recital Hall in May 2007 and has performed with diverse performing organizations ranging from the Eastman Wind Ensemble, to the Kansas City, Alabama, Key West, Jacksonville and Tallahassee Symphony Orchestras. As an active scholar, he has published articles in “Percussive Notes,” “Zildjian,” “Pearl/Adams” and “Innovative Percussion” online educational resources. The visit will culminate in a solo concert at 8 p.m. March 26 in the Ophelia Parrish Performance Hall. He will perform with the Truman Graduate Percussion Trio, as well as Truman faculty member, Michael Bump. Admission is free. For more information contact Michael Bump, associate professor of music, at 785.4052 or mbump@truman.edu. Cantoria joins forces with the University Chamber Orchestra, Truman faculty and guest soloists in presenting J. S. Bach’s wonderful Baroque masterpiece, the “St. John Passion,” at 7:30 p.m. March 28 in Ophelia Parrish Performance Hall. This performance presents the “Passion” in English and German, with real-time English translation of German projected onto screens at each side of the stage. The work follows the story of Jesus’ arrest, trial, crucifixion and burial as taken from John 17 and 18, word-for-word in the original German. Bach gives the storytelling of the named characters—the Evangelist and Jesus, Peter, Pilate, and auxiliary characters—to soloists (sung in English), while the group responses (of Roman soldiers, Jewish leaders, etc.) are assigned to the choir in short and often fast paced choruses. Bach interrupts the progression of the story with commentary. These commenting hymns and arias function as congregational and personal responses to the drama as it unfolds. Joining Cantoria and the Orchestra will be alumnus Frank Fleschner as the Evangelist, faculty members Yukari Yano (harpsichord), Brian Kubin (cello) Jacqueline Collett (soprano), and Elaine AuBuchon (oboe). Guest artists include Chad Payton (alto), Christopher Goeke (tenor), Christopher Mitchell (bass/Pilate), and Elizabeth Macdonald (viola da gamba), with Truman student Jason Qualls singing the role of Jesus. This work presents Bach’s most accessible side, a concise storyteller who understands how to pace a drama. Short movements, quick interchanges between soloists and choir, and the straightforward style of the chorales make this work accessible to many listeners and make it easy to engage in the story and its dramatic arc. It also presents Bach, the devout Christian, attempting to move listeners into active reflection and response to the story. Including intermission, the performance will last about 2 hours and 30 minutes. Admission is free and open to the public. The Career Center will host the 3rd annual Lend a Hand for a Living nonprofit poster display and mini conference April 1. The poster display will be from 11 a.m.-6 p.m. in the Student Union Building Activities Room. Students can stop by anytime to find volunteer, employment or career information from more than 90 nonprofit organizations. The mini conference will be from 6-9 p.m. in the Student Union Building Alumni Room. The conference is open to all students and designed to provide opportunities to learn more about the nonprofit sector. It is an interactive conference composed of a keynote speaker, three breakout sessions and a networking reception. Truman alumni and members of the Kirksville community will present a variety of nonprofit topics. Breakout session topics include: Nonprofit vs. For Profit Employment; Career Development in Nonprofits; Year of Service Panel Discussion; Finding Internships in the Nonprofit Sector; The Importance of Fundraising and Graduate Schools for Nonprofit Careers; and Volunteering: A Great Way to Get Your Foot in the Door. Students must pre-register for the conference by March 31 at http://pdi.truman.edu/register. Registered students will receive valuable information on nonprofit organizations. Melissa Passe, director of the Speech and Hearing Clinic and past president of the Missouri-Speech-Language-Hearing Association, along with nine communication disorders graduate students, attended the MSHA Legislative Day at the Capitol in Jefferson City, Mo., Feb. 19. While there, they were Representative Rebecca McClanahan’s guests on the House floor and attended presentations regarding lobbying efforts on behalf of the Association. 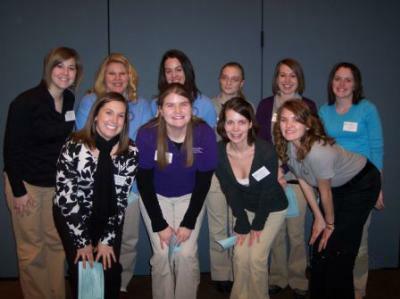 Pictured, front row, from left; Kim Fitzgerald, Amy Little, Tera Blickhan and Katrina Hough. Back row; Kim Biller, Melissa Passe, Cara Stanley, Sarah Lockenvitz, Susan Eberly and Angie McGinnis. The International Students Affairs Office is now hiring Hall Hosts for Fall 2009 scholarship or work-study positions. Hall Hosts are student who live in the Residence Halls and use their scholarship or work-study hours to assist international students. To learn more about this position and pick up an application stop by the ISAO in Kirk Building 120. For more information contact Liz Enberg at eae626@truman.edu or call the ISAO at 785.4215. The Career Center is hiring a communication intern, a website intern and scholarship and work-study positions for the 2009-2010 academic year. The communication intern will help plan and promote Career Center events. The website intern will help update and reorganize the Career Center’s website as well as create new web pages. Interested candidates should attend a required preview session at 6-7 p.m. March 24 or 5:30-6:30 p.m. March 25. The Truman Media Board is seeking applicants for a 2009-2010 webmaster position. The webmaster will be responsible for the design and maintenance of the five media websites, including audio, video, text and photo uploads and must be familiar with HTML and CSS code. This is a year-long commitment and the position is for institutional pay. Applicants may opt to apply the first 60 hours toward a scholarship requirement. Submit a resume and work sample by e-mail to blake.toppmeyer@gmail.com with the subject line: Webmaster Application 2009-2010. Applications are due April 1 and interviews will take place April 3-4. Health and Exercise Science and Communication Speech Disorders Faculty, along with the Counseling Center and the Student Health Center, will present a Faculty and Staff Wellness Fair at 8:30 a.m.-4:30 p.m. March 25 in the Student Union Building. Opportunities during the fair include concurrent health information sessions, free lunch sessions with a reservation, exhibit room, and free bone density, spirometry and hearing screenings with an appointment. Sessions include “Foot Health: One Step at a Time,” “Selecting the Right OTC,” “Living with Diabetes,” “Yoga Ball Exercises,” “Common Sense for Starting an Exercise Program,” “Understanding Your Screening Results” and many more. For more information about the Faculty and Staff Wellness Fair or worksite health promotion contact Janice Young at jcyoung@truman.edu or call 785.4461. Truman in Africa and Students for Social Change will sponsor Social Justice Week March 30-April 2. The purpose of Social Justice Week is to spread the concept of a world which affords everyone fair treatment and an impartial share of the benefits of society. Activities will begin with a Poverty Simulation at 6:30 p.m. March 30 in the Student Union Building Activities Room 3200. Guest speaker Jennifer Rafanan will present “Immigration in Missouri: Myths, Facts and Policy Considerations,” at 7 p.m. March 31 in the Student Union Building Georgian Room C.
A documentary about TOMS Shoes will be shown at 7 p.m. April 1 at the University Club House. The event will include showings of the award-winning documentary “Style your Soles,” an explanation of TOMS’ mission, at 7 p.m. and 8:15 p.m. For every pair of shoes purchased, TOMS shoes donates a pair to a child in need. Student with TOMS shoes can also decorate them at the event. Those wishing to purchase a pair can visit http://www.tomsshoes.com (with discount code CAMPUSTRU). For more information about the event, contact Tamara Arredondo at t.l.arredondo@gmail.com. The week will end with Displacement Camp in the Student Union Building April 2. An Invisible Children Documentary will also be shown at 8 p.m. in the Student Union Building Alumni Room. For more information about the week visit the Social Justice Week table in the Student Union Building March 30-April 2 or e-mail trumaninafrica@gmail.com. The Missouri Insurance Education Foundation will award scholarships to deserving students attending Missouri colleges or universities in a program that could lead to positions in the insurance industry in Missouri. The C. Lawrence Leggett Scholarship in the amount of $2,500 will be awarded to a junior or senior Missouri resident majoring in insurance or a related area of study in a Missouri college or university. In addition to the Leggett Scholarship, the foundation has made an additional scholarship available in the amount of $2,000. Application forms are available on their website at http://www.mief.org/. Applications are due by March 31. The Specialty Equipment Market Association (SEMA) scholarship is now available. Scholarship assistance is available to those pursuing careers in the specialty equipment industry. Career path opportunities include accounting, administration, advertising/PR, design/graphics, engineering, information technology, manufacturing, photo/journalism, race car driver/crew, sales/marketing, technicians and transportation. For further information visit the SEMA website at http://www.sema.org. Deadline for application is April 1. The Zonta Club of St. Louis is now accepting applications for the Jane M. Klausman Women in Business Scholarship. Women pursuing undergraduate business degrees who demonstrate outstanding potential in the field are eligible to apply. The woman must be entering the third or fourth year of an undergraduate degree program. Application forms are available on the Zonta website at http://www.zonta.org. Select international programs and click on education, leadership, and youth development. Applications are due by April 3. Alpha Delta Kappa, Sigma Chapter of Burlington, Iowa is offering one $1,000 scholarship to Des Moines County undergraduates who will be majoring in education. Further eligibility requirements include qualities of leadership, success in academics and involvement in extra curricular and/or community activities. While financial need will be considered, it will not necessarily be the primary qualification. For further information, stop by the Truman State University Financial Aid Office. Applications are due by April 3. The Jack J. Isgur Foundation is accepting applications from students enrolled in the field of education in the humanities, such as literature, fine arts, music, art, poetry and dance. The Foundation awards scholarships to students studying at colleges and universities who indicate an interest in teaching courses in the above-described areas in school districts located in the State of Missouri, preferably rural school districts. The scholarship is available to students at the junior and senior levels, as well as graduate students. For further information or an application, stop by the Truman Financial Aid Office in McClain Hall 103. Deadline for submission is April 15. Abbott & Fenner Business Consultants will be awarding up to $1,000 each year to the winner of this scholarship. To apply students will submit an essay on one of the two topics that appear on the scholarship page of their website at http://www.abbottandfenner.com/scholarships.htm. Application deadline is June 20. The BigSun Organization is offering a $500 scholarship to a deserving student athlete, regardless of their respective sport. Please visit http://www.bigsunathletics.com to learn how to apply. Deadline for submission is June 27. The Scholarship Foundation of St. Louis is a non-profit organization that provides access to higher education to St. Louis area students through interest free loans. The program assists students with financial need. Applicants must have a minimum cumulative 2.0 grade point average, demonstrate good character, and must be a permanent resident of St. Louis City, St. Louis County, the Missouri counties of Franklin, Jefferson, Lincoln, St. Charles or Warren, or the Illinois counties of Clinton, Jersey, Madison, Monroe or St. Clair for at least two years prior to application. Applications are due April 15, 2009. For more information call 314.725.7990, e-mail info@sfstl.org or can pick up an application packet in the Financial Aid Office. SMACS Incentive Scholarships of $500 for Fall 2009 are available to non-math and computer science majors who take classes in these fields. To be eligible, a student needs to have financial need and take math or computer science classes that do not meet a current major requirement. Other requirements, and the application form, can be found at http://smacs.truman.edu. Students interested should apply by March 27 for first consideration. For more information contact Dana Vazzana at dvazzana@truman.edu. Register for events on the PDI website at http://pdi.truman.edu/register/classlist.asp. Sodexo will be collecting non-perishable food items for Kirksville families in need. Drop off locations will be at Mainstreet Market, all campus convenience stores, and Ryle, Missouri and Centennial dining halls. Meals, dining dollars and bonus bucks can also be donated with a percent of the proceeds going to the Kirksville Food Bank. Eight models and two designers will compete for cash prizes. Admission is $1, door prizes are awarded, and hors d’oeuvres will be served. A movie based on the struggles of the North Korean people. Amnesty International will host the screening. All students are encouraged to file the 2009-2010 Free Application for Federal Student Aid (FAFSA) located at http://www.fafsa.ed.gov. It is important to apply before April 1 to be considered for all available funding. Contact the Financial Aid Office, McClain Hall 103, at 785.4130, with any questions. Tickets are on sale now in the lower level of the Student Union Building. They are free with a Truman ID and $5 for general admission. Epsilon Kappa American Cancer Society Relay for Life Team. Check out http://www2.truman.edu/~kan4887 for more information. Multicultural Affairs is accepting applications for 2009 Scholastic Enhancement Experience (SEE) Program Counselors. SEE Counselors spend two weeks in the summer helping underrepresented first-year students build a strong community and learn how to be successful as a Truman student. SEE Counselors will receive $500 and free room and board during the SEE Program. SEE Counselors are responsible for: serving as role models to program participants; monitoring students in a residential environment to ensure individuals are in compliance with Residence Life and University policies and regulations; organizing social activities and workshops that will positively impact the participants academic and personal growth; serving as the bridge between the participants, Multicultural Affairs and the University; and building strong community between scholars while having a positive influence on their initial Truman experience. The 2009 SEE Program will run from Aug. 9-20. SEE Counselors will report for duty Aug 6. Applications are due by 5 p.m. April 3. Applications and more information can be found on the Multicultural Affairs website at http://mac.truman.edu under the SEE Program. For more information, contact Bertha Thomas at bthomas@truman.edu or 785.4142. The Truman Public Relations Office is now accepting resumes for the full-time Fall 2009 internship position. Interns can receive course credit, a stipend and valuable experience in public relations office duties. Interns usually take six hours of class in addition to six hours of internship credit. Applicants should have a stong background in writing and editing. Communication majors are encouraged to apply, with special consideration given to candidates with knowledge of Associated Press style, experience in desktop publishing and familiarity of InDesign or similar software. To apply, send a resume, two writing samples and contact information for two on-campus references to the Public Relations Office, McClain Hall 101. For questions, contact Heidi Templeton at heidi@truman.edu. Deadline to submit information is April 2. Beta Alpha Psi provides FREE Volunteer Income Tax Assistance to the community. All volunteers are IRS certified and all returns are reviewed for accuracy. For more information visit http://bap.truman.edu or call 785.4268. The Library has Research Guides for all area. To find the best sources for any subject including: Biology; Graduate and Professional Schools; Public Policy Making or Religion, use the Research Guides. For more information visit http://library.truman.edu/guides/mainpage.htm. Faculty, staff and students are eligible. Participants must be 18-50 years old and meet certain criteria. FEMA has provided Pickler Memorial Library with a portfolio of publications with practical suggestions to help citizens prepare for natural disasters such as floods, tornadoes and earthquakes. Materials are on reserve at the Library Circulation desk. Ask for the FEMA Publications folder. Copies of resources are available upon request. All information, rules and registration requirements are online at http://recreation.truman.edu/intramuralrec.asp, or contact the Intramural Office at 785.4467. Members of the National Education Association Student Program attended the Student NEA State Conference Feb. 27-28 at the Doubletree Hotel at Westport in St. Louis, Mo. Members attended various workshops for future teachers, met members from other university chapters throughout Missouri and heard from keynote speakers Lily Eskelsen, NEA Secretary-Treasurer, and Margaret Williams, Missouri Teacher of the Year. In addition to workshops, Truman’s chapter took home five of the seven awards including Best Webpage, Outstanding Chapter Project and Best Newsletter. The chapter president, senior Amanda Balk, was awarded Diligent Chapter Leader, and the Truman chapter was awarded Outstanding Chapter for the second year in a row. Tenn., at SIGCSE 2009, was the 40th annual technical symposium on computer science education. Accompanying Beck on the panel were Vicki Almstrum, professor of computer science at the University of Texas at Austin; Heidi Ellis, assistant professor of computer science at Trinity College in Connecticut; and Massood Towhidnejad, professor and chairman of computer and software engineering at Embry-Riddle Aeronautical University. Taner Edis, associate professor of physics, presented a lecture on “Science and Religion in Islam,” at the Center for Middle Eastern and North African Studies March 16 at the University of Michigan. An original musical work by Warren Gooch, professor of music, will be performed in San Francisco later this spring. The composition, entitled “The View from the Tower,” was selected via an international call for musical scores. This composition consists of seven comedic songs for voice, piano and tuba that take a humorous look at different aspects of the academic profession. “The View from the Tower” will be performed May 22 and 23 by cast members of the San Francisco Cabaret Opera in their “Fresh Voices” concert series. The San Francisco Cabaret Opera Company is affiliated with Goat Hall Productions, an organization dedicated to bringing innovative and entertaining theatrical concert music to the San Francisco Bay area. The Governmental Affairs Committee of the Kirksville Area Chamber of Commerce will sponsor a public forum March 24 at the Shrine Club to introduce candidates running for Kirksville City Council and address other local issues on the April 1 ballot. Candidates will be available to meet members of the public from 5:30-6:30 p.m. A question and answer session, moderated by representatives of the local media, will take place from 6:30-7:30 p.m. TruNews staff will be on hand to tape the forum so those community members who were not able to attend will have the option of viewing it on the City of Kirksville’s cable channel 3. Times will be posted later. Truman students living on campus will have the option of viewing it on the University’s cable channel 36 at a later date. The Society for Sino-American Studies will host a Diversity Forum for members of Unique Ensemble, HALO, College Democrats, Phi Beta Lambda, Society for Sino-American Studies and the Center for Student Involvement at 6 p.m. March 24 in the Student Union Building Alumni Room. Participation is free for this event. An introductory lecture for Art of Living Club’s “Short course in Deep Meditation (Sahaj Samadhi)” will take place at 7 p.m. March 26 in McClain Hall 208. There will be a free lecture on meditation and its benefits and opportunity to register for upcoming course March 28-30. All students, faculty, staff and community are welcome. Leadership Forum will sponsor speaker Angela “Bay” Buchanan at 8 p.m. March 26 in Violette Hall 1000. Buchanan will discuss illegal immigration and is the sister of Pat Buchanan and a CNN contributor. Omicron Delta Kappa, national leadership honors society, are accepting applications for their Leadership Hall of Fame. Applications are available for all graduating seniors, can be found at http://odk.truman.edu/new_page_2.htm and are due by March 27. Finalists will be interviewed by April 1 and announced at the Leadership and Recognition Program April 8. Alpha Kappa Alpha Sorority Inc., will present “The Equation of Life” with Omar Tyree, an author, journalist, performance poet, songwriter, screenwriter, entrepreneur, innovator and energetic speaker. Tyree will be discussing the Four Indisputable Components of Business Success at 8:30 p.m. April 2 in Baldwin Hall Little Theater. This event is sponsored by the President’s Office, Residential College Program and SUB After Dark. The Computer Gaming Association and SUB After Dark are back with the second Ultimate Night of Games at 8 p.m. April 3 in the Student Union Building Hub. This time there will be board games, card games, social games and of course video games including Rock Band, Dance Dance Revolution, Mario Cart, Wii and more. Food will be provided. SUB After Dark will host a March Madness Final Four College Basketball Championship watch party at 8 p.m. April 6 in the Student Union Building Hub. Free food and games will be provided. A romance language public lecture will be presented by Thomas D. Cravens, professor of Italian and linguistics at the University of Wisconsin-Madison, entitled “Why Romance Linguistics?” at 11:30 a.m. April 6 in the Student Union Building Alumni Room 2105. The Hispanic American Leadership Organization and the Spanish Club will present salsa lessons free of charge at 7 p.m. April 8 in the Student Union Building Room 3204 and April 15 in the SUB Georgian Room A. Participants can put these lessons to use at a Latin Dance Party scheduled for 8 p.m. April 17 in the Student Union Building Georgian Room A.